As happens sometimes with a Sepia Saturday prompt, I immediately thought “how can I write on this?”… “I’ve got nothing in my family history that fits”. Turning to Trove, the Aussie genealogists’ friend, I searched for “police + chemist”. Did you notice there was a chemist’s shop in the background of the featured image? So far, so good. I found one in my home town in Brisbane for when I was a small girl. 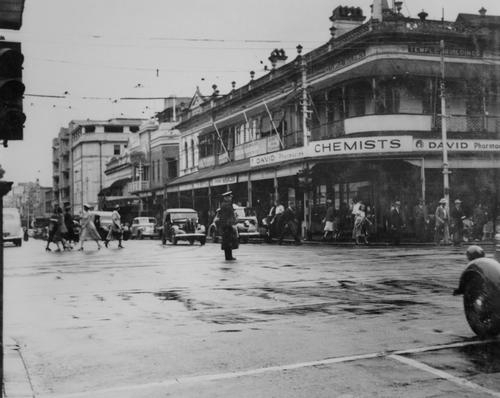 There was the policeman directing traffic on the corner of George St. Still this didn’t quite satisfy me so I kept hunting and found this one of a 1966 protest in Brisbane against conscription. Immediately my story fell into place. Strangely there are some similarities to Kristin’s Sepia Saturday story on Finding Eliza. Of course much of this is personal anecdote reflecting my own experience, and Dad’s, and others may well have different perspectives. Back in the bad old days of Queensland, the state was held on a tight rein by the government, irrespective of which political party was in power. This was particularly the case in my teenage years when the rights and wrongs of the Vietnam War were hotly debated by students in particular. 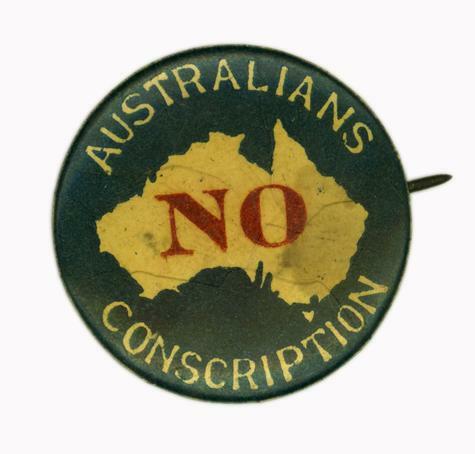 After all, they did have a vested interest, since young men aged 20 automatically went into a birthday ballot which decided whether they would be conscripted and then go off to war. Official sites, including the Australian War Memorial, state the crunch-point was for 20 year olds yet we have always believed it to be 18 so perhaps it was just the anxiety of it that made it seem that way. Of course, the friends who were keen to go were never the ones whose number came up, while those who weren’t, or indeed registered as pacifists, seemed inevitably to be called up. To an extent you were “safe” while you continued your university studies as you could defer your enlistment until they were completed, something non-students weren’t able to do. It wasn’t until 1972 when Gough Whitlam, our former Prime Minister who died this week, rescinded the ballot and conscription, as well as Australia’s involvement in the Vietnam War, that this changed. It’s also worth noting that in this era, we could not vote or drink (alcohol) until we were 21. This song by Redgum is a diversion but tells the story of “I was only 19“. Mr Cassmob was able to avoid the conscription birthday ballot by always, and only, stating his residence as Papua New Guinea, making him ineligible. Even though he’d been in the Army cadets at school, he was in no rush to be conscripted. Frighteningly, for the first time tonight, reading the AWM link above, I’ve learned that Mr Cassmob’s birthday was drawn in the ballot for the year he turned 20. Like campuses the world over in the 60s, there was an active political scene and The University of Queensland was no exception. Led by the charismatic left-wing speakers Brian Laver and Mitch Thompson from Students for Democratic Action (SDA), students gathered at lunch time in the “Forum”, an area outside the Refec (refectory) to hear the issues of the day debated. Of course, equally typical of the era, it was a very male-dominated environment. 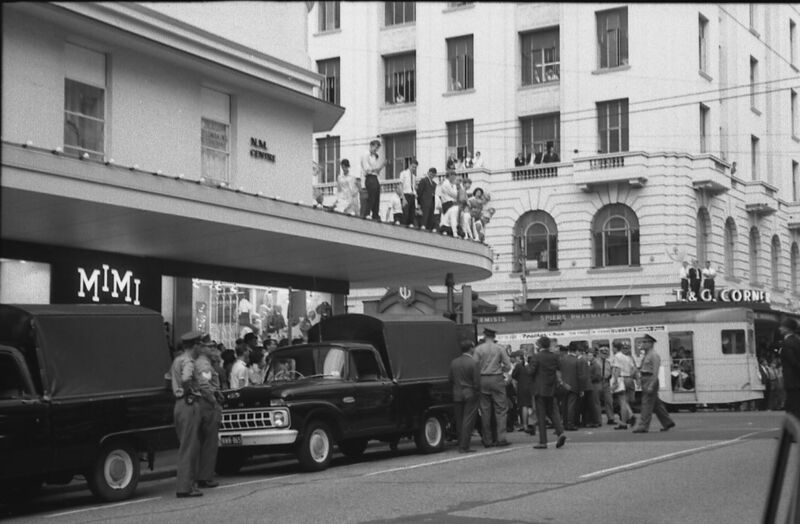 Although the issue of Vietnam was high on people’s minds, this became overshadowed by the fact that it was then illegal to march in Queensland without a state-issued permit…and you guessed it, your chances of obtaining same were pretty much zero. It all came to a head in September 1967, in some ways strange timing given that university exams were held annually those days in early November, so we should all have been preoccupied with study and revision. In fact my mother was given a warning by my Chem I tutor (a Professor of Chemistry) that she should get me away from the “troublemakers” I was hanging around with. Perhaps he meant the Catholic Newman Society of which I was an active member? Dad on the other hand was asked by a policeman who lived locally if I would report back to him about what was going on…he was sent away with a large flea in his ear. We were certainly aware that the Police Special Branch had officers among the crowds at the Forum. One thing that strikes me about student attire in those days was how conventionally they were dressed. On 8 September 1967, thousands of students gathered to debate whether to stage an illegal march into the city. There’d been a trial/temporary march down to the end of the campus a few days earlier but this was to be the real thing. It certainly wasn’t spontaneous as Dad had already forbidden me to walk in the march. He cited what he’d witnessed during the St Patrick’s Day railway strike in Brisbane 1948, not all that long before my parents were to be married. If I wanted to have children, he said, I couldn’t march. 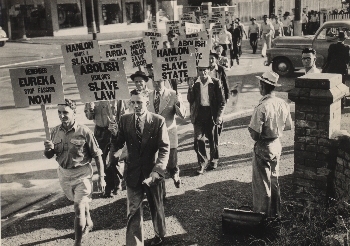 Ross Fitzgerald, a Queensland historian refers in his book From 1915 to the early 1980s: a history of Queensland[i] to “a woman demonstrator was hit between the legs with a banner…” This photo, from this book and also from DJ Murphy’s collection at Fryer Library, demonstrates that Dad was certainly in the right place on the day to know what he was talking about, in terms of things getting violent. Skipping forward to the meeting on 8 September 1967, staff and students debated and voted to proceed with an illegal march from the campus at St Lucia to the city, about 8 kilometres. Around 4000 people participated in the march, if current reports are accurate, and certainly the crowd was huge. We had been urged to be non-violent at all times and not to actively resist police and the watch house sheets suggest this was largely the case. Just imagine the potential for it getting completely out of hand – hardly surprising the police were nervous, especially those brought into the city for the event. You can get a sense of the crowd from images on this website. Somewhere in that crowd were two young fresh-faced undergraduates, and many (but not all) of their mates….good former Catholic school students all. An interesting article on this aspect is here. True to my promise to Dad I became one of those who “showed their interest and support by following behind the main demonstration on the footpath”. Along the way I nipped into shops and bought cold drinks for my mates. As we neared the end of Coronation Drive, near what was then the Arnott’s factory (as I recall) we got word that the Police planned to trap the marchers in the underpass under the Grey Street Bridge (now the approach to the motorway)…the Police headquarters were in nearby Makerston St. The march direction was then re-routed to go along Roma Street in front of the railway station and it was an impressive sight, with marchers filling what seemed the whole length of the block. When they were given the official warning to stop the march, the protesters linked arms and sat down on the roadway. And that was where the “fun” began. You can see the video here. 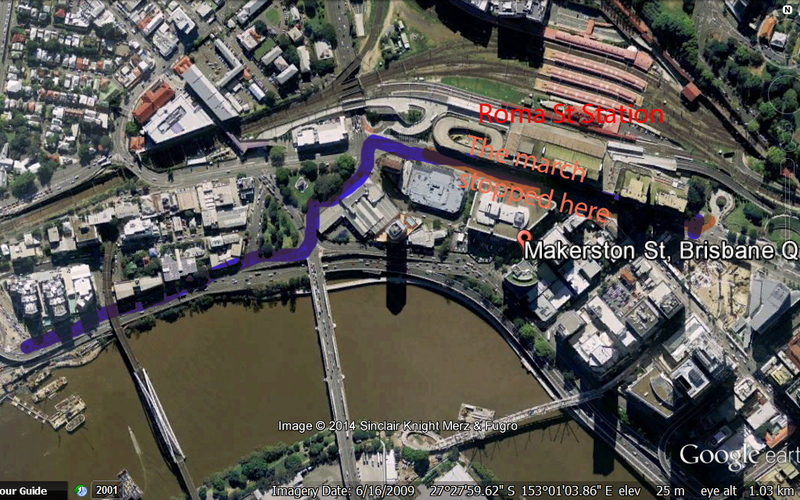 This Google Earth map shows the last stage of this civil liberties march and the route diversion, finishing outside Roma St Railway Station. For some reason I took a slightly different path, and arrived in Roma Street (near where my father worked) soon after in time to see an ocean of blue uniforms and suits, students emerging with ripped shirts, signs being smashed, friends with blood on their faces. It really was confronting and sobering. Anecdote states that many police had removed their identifying badges on the day. Ironically a few of my relatives would have been there that day along with a new constable who we became friends with in Papua New Guinea. Even thinking of it now, my knees start to shake. A screen dump from the vimeo video of my other half 1967. Eventually I found my new boyfriend, as he was then, and he was safe if somewhat shaken. Another girlfriend from school was less fortunate as she was taken to the watch house (though she’s not on the charge sheets)….she shook for days afterwards. For those with patience and interest the video of the day is now online and Mr Cassmob can be seen along with another of our mates. The original film is now held at the National Film and Sound Archive in Canberra and is one of the things I hope to follow up at Congress 2015. As if that wasn’t enough we reconvened down near Parliament House and watched as yet more protesters were thrown into paddy wagons. I still admire the restraint of the police officer who stood in front of me as I expressed my disquiet (not entirely politely)…he simply ignored me, so I was lucky not to have a trip to the watch house myself. In the aftermath, Parliament was closed to the public as the matter was debated. 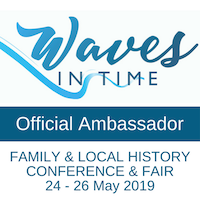 Somehow Dad was the only member of the public to attend, thanks to their local Member of Parliament, Manfred Cross, or so the family story has always gone from Day One. It would take decades, and the demise of Joh Bjelke-Petersen’s reign, for the issue of civil liberties to change in Queensland. Even when I started working at UQ 15 years later, I met others who’d marched in the anti-Springbok protests of 1971. Of course by then we were living in isolated Papua New Guinea with a small child to care for…we had been “suitably” transformed into moderates…well up to a point. 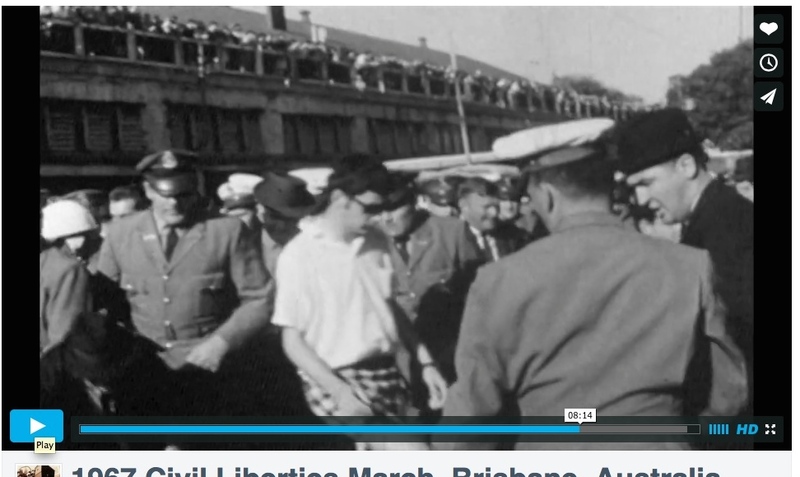 The irony is that while working at UQ in the 1980s there was a student demonstration against the administration in the building where I worked….it was strange and scary to be on the other side of the fence with people yelling “at you”. The other irony is that when the political environment opened up, most students stopped caring so much about these broader issues. This may all sound very anti-police, but as I mentioned I have police officers in my family, far and near, and I can sympathise with them on these matters…you just never know when something as large as the 1967 protest will get out of hand. At the end of the day, Police respond to government decisions and the law of the time, and in that era, the democratic right to protest was non-existent. I wonder where other Sepians marched to with this week’s topic? Enthusiastic readers can learn more about Queensland’s Railway strike in this online edition of Denis Murphy’s book The Big Strikes 1889-1965. 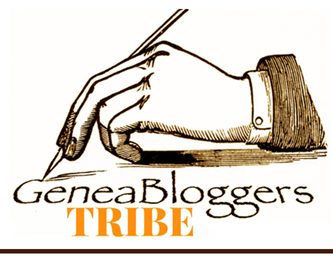 You might also be interested in this blog post on the ballot and Vietnam by my late friend Catherine on her blog Seeking Susan~Meeting Marie~Finding Family. There’s plenty for me to follow up one day in the UQ Fryer Library holdings and Hansard. 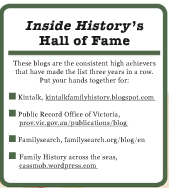 [i] From 1915 to the early 1980s: a history of Queensland. Fitzgerald, R. University of Queensland Press, St Lucia, 1984, page 130-131.